The work that I do at Helios Digital Learning has sparked a passion for telling stories via the documentary film medium. Below you will find information about completed projects and projects in development. 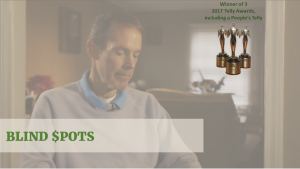 Blind Spots tells the story of a once successful bond trader, Jay Nolan, who got in over his head and found himself hiding his customers’ losses from them. Jay shares his story about how the bad decisions he made while trying to make up the losses, grew into a larger fraud which ended up sending him to jail. Every year, many products are recalled because they pose a danger to consumer health. Sometimes the hazards posed are relatively minor and their causes are inadvertent. At other times, the hazards can be deadly and their causes are intentional. Despite bad publicity, costly lawsuits and, in far too few cases, jail time for company executives, the nightly news continues to carry stories of these intentional cases. It is easy, and even comforting, to believe that the companies responsible for knowingly unleashing deadly products on to consumers are isolated bad actors who can be punished and deterred by fines and stricter regulations. But what if that is not the case? And, if fines and regulations don’t serve as effective deterrents, will anything? How could one woman steal $53 million without anyone noticing? 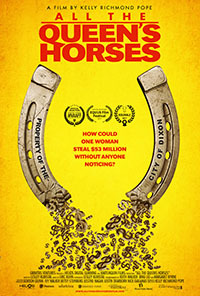 All the Queen’s Horses tells the story of Rita Crundwell, the perpetrator of the largest case of municipal fraud in American history. As city comptroller of Dixon, IL (population 15,838), Crundwell stole $53 million dollars of public funds across 20 years. She used the funds to build one of the nation’s leading quarter horse breeding empires, all while forcing staff cuts, police budget slashing, and neglect of public infrastructure. All the Queen’s Horses investigates her crime, her lavish lifestyle and the small town she left in her wake.